Dreams do actually come true, and like someone said, your dreams are valid! For your custom built home you’re probably looking for something that will make your home standout. What better way to make your home look classy and more elegant than to have Italian marble flooring? The elegant black-white colored Italian marble floor design it is. This elegant Italian luxury marble floor designs are minimalistic in color, but with a strong color combination. The creamy white on the design is a color that I personally refer to as a rich color. It is a color with a flat power spectral density. The combined colors offer a great contrast in your living space. The two are cool and exciting. This luxury marble floor designs are rather versatile with the ability to adorn your living room, bedroom, kitchen and even the theatre room. It works in just about any space in your custom built home. 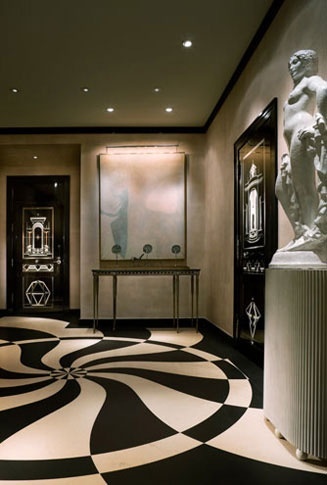 The floor design epitomizes quality craftsmanship in marble flooring. The floor design is light schematic and it is sure to deliver your luxury space with a great mood. By adding this elegant black-white colored Italian marble floor design you will be taking the easy and elegant way to create your theme throughout. The mixing of the two colors is done artfully in elaborate patterns. It is a reflection of the product’s superior quality. The colors radiate from the “heart” of the design outwards. At the centre, where everything seems to originate from, the patterns are smaller and narrower and they get bigger and wider as they extend outwards. The “growth” in size of the patterns creates an enchanting effect for the whole room. As you might know, one of the prized qualities of marble floor is its ability to take amazing polish finish. This Italian marble design has been buffed and it glistens in the light. The design will actually glow in a well lit room. The highly polished finish also presents your home with a floor design that is perfectly smooth to the feet. If you want a floor design with a difference, then get your hands on this lovely, one of a kind Italian marble floor design. Some additional touches to create a piece that is truly you can also be include upon request. Some of the personalized touches may include anything from a different type of marble to fusing several other colors and custom installations. If you would like additional information about the Black-White Italian Marble Floor Design, do not hesitate to call our design experts at 1-888-272-0630. Posted 4 years, 7 months ago at 8:27 pm.